While Gamescom has yet to open its doors, big surprises and reveals are already oozing out of Cologne. Activision held a special conference earlier today, revealing something that was bound to cause shock. 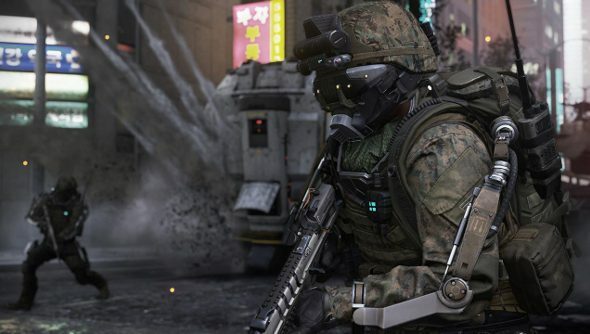 Call of Duty: Advanced Warfare will have multiplayer. One man in the audience fainted. Another tore off all his clothes and roared for five minutes. And that was before any footage was shown. So. It has multiplayer. But what’s it going to be like? Well, quite different from previous Call of Duty iterations and, hmmm, quite a lot like Titanfall. It’s come full circle. Respawn’s multiplayer shooter owes a lot to Call of Duty, and now Advanced Warfare is aping design from Titanfall. It’s not a bad thing though. Movement in Advanced Warfare looks gloriously fast and fluid, with exo-suit wearing shooty men dashing, dodging and flying around the battlefield. The best part of Titanfall, I reckon, was being a pilot absent a Titan, and that’s really what Advanced Warfare multiplayer instantly reminds me of. Augmented soldiers are, obviously, quite a lot more fun to play than regular dudes with guns. This increased freedom of movement has informed map design, too. Modes and maps play to the strengths of these future soldiers, with lots of lovely verticality. While people are inevitably going to focus on the fact that it looks like something else, what we should be focusing on is that it doesn’t look exactly like Call of Duty: Ghosts. The multiplayer has been coasting, especially with Ghosts, which introduced little of value. A shake up was in order, and it looks like Sledgehammer are at least doing that.